Hello!!! Hello!! We are having lovely Sunny weather the last two days in the Netherlands, still a bit chilly; but just waking up and seeing the Sun shine just makes my day. 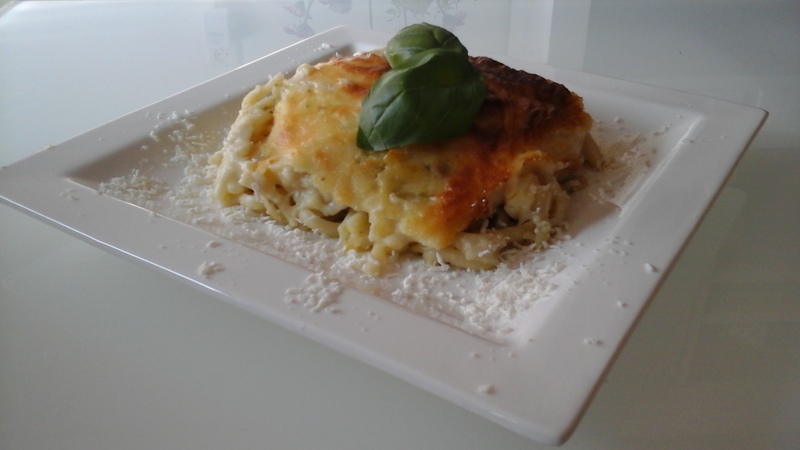 Anyway, I made this dish today, it is one of my favorite recipes baked Zucchini with Pasta and Feta Cheese, topped with Bechamel Sauce, a very simple and tasteful recipe. 🙂 I hope you enjoy it! Boil Pasta in salted water, strain and set aside. In a bowl toss in the Pesto, salt, the Feta Cheese diced into cubes, and diced Zucchini. Mix ingredients, add into your pasta. In a medium size buttered baking pan, add in the pasta mixture, and spread. Then take a medium size sauce pan, add in the butter stir until melted, add the flour continue to stir, slowly add in the milk, nutmeg and stir until it has become one thick sauce. Top your pasta mix with the Bechamel Sauce and pop into the oven for 1 hour. Ah now i see the beautiful picture from the dish! It looks dilicense (heerlijk). Tomorow we wil tast it!